Doanload Pelaporan DSKP Tahun 4 at the KSSR section. 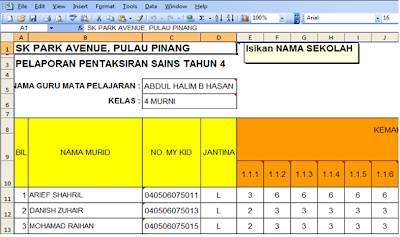 Beginning next year, Year 4 PBS result will be keyed in 'offline' in Excel file format known as Pelaporan DSKP. There is no need for Year 4 PBS teachers to key in online in the SPPBS which is still going on for Year 1 , 2 and 3. The Excel format looks quite similiar to PLBS or SBOA whereby marks keyed in in the overall result sheet will be automatically linked to individual pupils result. Every subject has its own Pelaporan DSKP contents. We do not know if schools will be provided the Pelaporan DSKP files for all subjects next year. Anyhow , we will keep uploading the Pelaporan DSKP we had, just in case teachers need them. Click the link below to download Pelaporan DSKP.